Hi all! Hope you have been enjoying your week. Did you get an area organized this week? I can’t stress enough how important a command center is to have in your home. 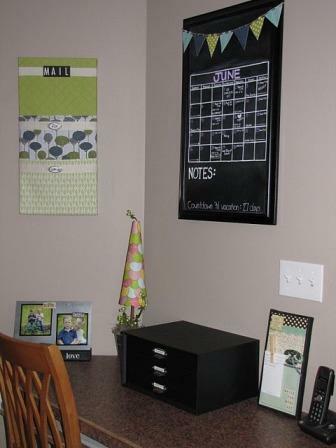 It is a central location in your home or a “hub” if you will where you corral very important papers, your family calendar (you do have a family calendar don’t you? ), organize mail and bills, etc… It doesn’t have to be expensive…I love that Jenn made her mail organizer, calendar and message board herself saving a ton of cash I’m sure. Very creative! 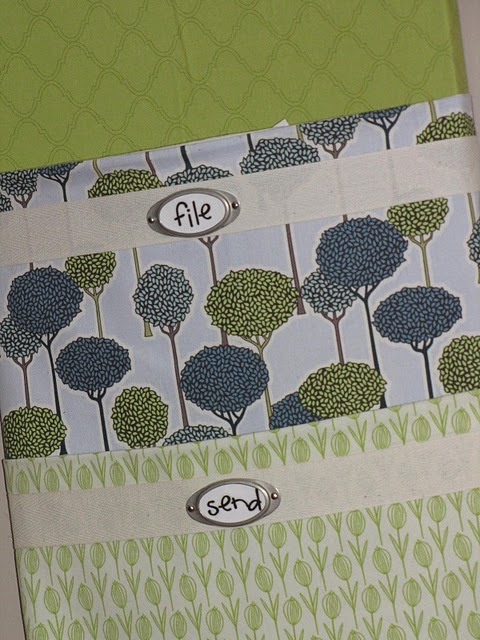 The tutorial she used for the mail organizer is just excellent by the way. I don’t really have any nooks or crannies in my kitchen so my command center is my fridge. I’ve got both my calendar and Fridgefile located there and I would be absolutely lost with both of these things. Nothing fancy at all just totally practical and functional and that is what is most important of all. I don’t want to re-invent the wheel here as I’ve blogged before about creating a command center so if you are interested in more ideas please visit my post on Command Center Ideas. Do you currently have an area in your home for a command center? 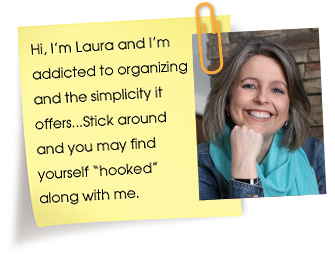 Have you had any luck implementing any of the tips from my book, Clutter Rehab? 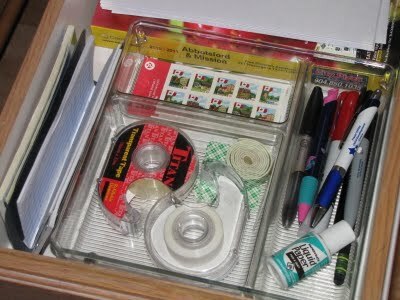 Have you been able to maintain the spaces you have already organized? We are preparing to move overseas in a few weeks, and my house is a WRECK. It’s driving me crazy!!! But one thing I’ve never had in this house is a command center like this. You can bet there will be one in our new house in Italy! Thanks so much for the organizing tips – I’m loving the 52 weeks! We don’t need alot of stuff. We just need the right stuff! In a place that’s accessible! I just found you by chance. I really need some inspiration to get myself organized. Is it too late to start posting to my blog? It’s really sad because we just bought our own home early March and already I’m back in my old habit of piling things here and there. We moved from 3 rooms in a basement to a 3 bedroom house. In other words, we went from little room and little storage to plenty of room and plenty of storage areas. I’m not doing well! When we went from a four roomed flat to a seven roomed, two-storey house, I suddenly found my paper becoming chaotic. I realised that it was because all the bits that I needed to do my paper (stapler, filing system, shredder and recycling bin) were all too far away from each other in this new place, it had all got separated. Now, I have everything I need in one corner of my dining room, it’s much easier to corral. Thanks for quoting me and the link! The legos have stayed organized so far, and I noticed another benefit— I can easily identify WHO left the mess out! YAY!!!! I’ve never had a command center. I need one, but its something I’ve just never bothered to do. Moving every 2-3 years makes it hard to set things up sometimes. I never know what sort of area we will have. I feel like I spend all of my time trying to settle in, or get ready to move. My goal with this move is to be organized enough that we can settle in quickly. Maybe I’ll even be able to fine tune things this time before its time to pack up again? We have a command center – though it is in 2 spots in the kitchen, but it works well for us. I have been able to maintain most of the changes I have made. That table keeps getting messy, but it is just something I need to tackle every day. You are so right. Organizing even one small piece of our big worlds can make life seem better. Do you respond to emails? I sent you one a while back and never recieved a reply. Hi Mammadar, I’m sorry your email hasn’t been answered. I’m so swamped and unfortunately email is the first thing to be neglected. I try hard but I only have so much time I can dedicate to computer work without neglecting my family. I hope you understand. I have been organizing. I don’t think I have 23 things done yet, but I’ve gotten quite a bit done, and I’m actually going to post my results of my most recent closet reorganization on the next 52 weeks post. I uncluttered my makeup drawer, and I’m about to post that. I’m doing pretty well keeping things organized, but my family… not so much. I’m especially having a hard time keeping our pots and pans in a decent state. Any suggestions? I keep mine in the drawer under the stove. Anyway…..THANKS for the super idea! I appreciate “stealing” your plans! I have tried to set up a command station on the counter where we dump our stuff when we come in and it just doesn’t seem to be working due to space. It’s a counter in my kitchen next to my fridge that hs next to no wall space to hang a calendar. I’m considering using the front room which we always designated as an ‘office’ though we never really use it for that. I’m just worried that we won’t use it since it’s not where we come in at. Suggestesions? I know your post is really old, but I wanted to comment on the command center you have on a counter space next to your fridge. My sister and my mother both have these set-ups in their homes. My mother has hung her calendar on the side of the kitchen cabinet that is above the drop-zone countertop; and my sister has her calendar on a magnet on the side of her fridge that is right next to their drop-zone countertop. I bought a spice rack that is a white metal (really pretty design) that has 2 pocket shelves and 4 key hooks on it — I hung this on the wall beside the side door where we come and go. The top pocket is where I put my outgoing mail, the bottom is where I put my dog’s collar, and the hooks are where we hang our keys. Hope this gives you some ideas. I just entered! We have 9 kids! Without being organized, I can’t function!